One of the saddest days of my college life happened when Pelmeni closed. Pelmeni was a tiny little restaurant in Madison that served just that – pelmeni, or Russian dumplings. They had meat or potato or mixed and you could get it spicy or plain. There were piles of sour cream in the cooler and a few sodas, too. Not spicy enough? They had bottles of some sort of magical spicy sauce that you could dump onto the pelmeni. I was devastated when they closed. Where else was I going to be able to get such a filling meal for only $5? 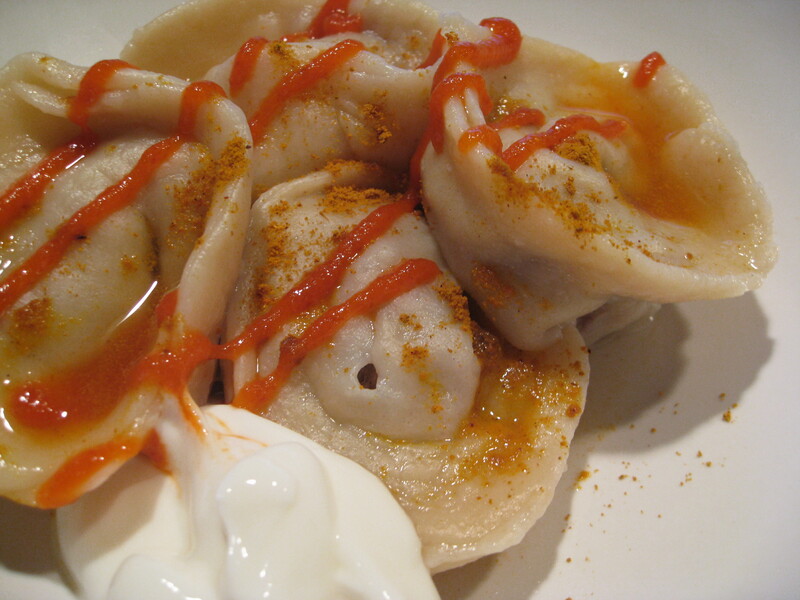 I searched everywhere for pelmeni – in grocery stores, other restaurants, everywhere. I finally gave up and tried making my own version. The verdict? I think it came out pretty close to the original State Street restaurant. Place flour in a large bowl. Make a dimple in the top of the mound and crack the egg into it. Add salt. Gradually add cold water and knead. Knead dough until smooth and elastic, about 15 – 20 minutes. Combine all filling ingredients and mix until all ingredients are evenly distributed. Set aside. Roll the dough into a rope 1 inch in diameter. Cut into 1 inch pieces. Roll the pieces into circles 1/16 of an inch thick. Place a teaspoon of filling into the center of the dough and pinch the edges to seal the pelmeni. The pelmeni will be in the shape of a semi circle. Bring the two pointed ends together to form the final shape. Mix the butter and vinegar together and set aside. Boil the pelmeni in salted water for 3 – 5 minutes. Toss the cooked pelmeni with the butter and vinegar and garnish with a dollop of sour cream, a dash of curry powder, a sprinkle of cilantro and a drizzle of Sriracha! Categories: Beef, Main Entrees, Meat, Pasta | Tags: beef, main dish, meat, onion | Permalink. I LOVED PELMENI!! Thank you! I’m gonna try this asap! i tried this last night and it was delish! thanks for sharing. Hi there! Wanna hear something freaky-friday? We have a little restaurant here in our little college town of Bellingham, WA called Pelmeni where they only serve potato or meat dumplings and you can add a magical spicy red sauce! I was recently turned on to it (even though it’s been here nearly 10 years now) and I am OBSESSED. It’s my Tuesday tradition to have lunch there with my assistants now. Anyhoo, I’m home today making pierogis and have been searching far and wide for a recipe for that red sauce — and here you are!! Can’t wait to try it out. It sounds like it’ll be identical to the restaurant recipe. Thanks for visiting my blog. I was looking at Pelmeni when they were open in WI and found that they made all their dumplings in WA somewhere and that there was a restaurant in WA that served them… I wonder if this is it?! Oh — and the place is on State St. too. Looks like it’s at 1211 N. State St.
After a fiasco with the dough, Eli and I finally got the ratios right and they are SO NOMMY! We love them. 🙂 On a scale…I probably love them more than Mike. The dough tastes like the homemade dumpling dough (doh!)! I went to college at the UW. Pelmeni was one of my favorite restaurants on State Street. After moving from Madison, I heard that Pelmeni had closed. So I was determined to one day make Pelmeni for myself. The dough was very sticky in my first two attempts. I stumbled across this blog in an attempt to find more suitable proportions for the dough ingredients. My latest attempt had 1-1/2 flour, 1/2 cup water, and 2 eggs. I ended up adding at least another half cup of flour due to my inability to work with the dough. Will I have that problem with this dough recipe? Hey Erin – I didn’t have problems with my dough when I made this. Give it a try and let me know how it turns out! If you make an modifications, let me know and I’ll be more than happy to add in your modifications with the recipe above. Good luck! I too enjoyed the Pel-Meni on State Street in WI until they closed…but then I found out there was one in Bellingham, WA. Luck would have it that my friend was living out there, so I made a quasi pilgrimage. It was awesome. Delicious dumplings, same deal. Though, and I have to say it, the one on State street was better somehow. Probably because I didn’t have to go across the country, but meh. Also, for those with the dough recipe issues, yeah, I agree and have had the same problems. There has to be some universal trick that we’re all missing. Like, Russian in our blood or something. on Pelmeni | DoughSeeDough. I do have 2 questions for you if you do not mind. of the responses appear as if they are left by brain dead visitors? 😛 And, if you are writing on other places, I would like to follow you. I wɑnted to tɦank yoս ffor thiѕ ǥreat read! !